Asteroid 51826 Kalpana chawla, one of seven named after the Columbia's crew. On February 5, 2003, the Prime Minister of India announced that the meteorological series of satellites, MetSat, was to be renamed "Kalpana". The first satellite of the series, "MetSat-1", launched by India on September 12, 2002 was renamed "Kalpana-1". 74th Street in Jackson Heights, Queens, New York City has been renamed "Kalpana Chawla Way" in her honor. The Kalpana Chawla Award was instituted by the Government of Karnataka in 2004 to recognize young women scientists. NASA has dedicated a supercomputer to Chawla. One of Florida Institute of Technology's student apartment complexes, Columbia Village Suites, has halls named after each of the astronauts, including Chawla. The NASA Mars Exploration Rover mission has named seven peaks in a chain of hills, named the Columbia Hills, after each of the seven astronauts lost in the Columbia shuttle disaster. One of them is Chawla Hill, named after Chawla. Steve Morse from the band Deep Purple created the song "Contact Lost" in memory of the Columbia tragedy along with her interest in the band. The song can be found on the album Bananas. Novelist Peter David named a shuttlecraft, the Chawla, after the astronaut in his 2007 Star Trek novel, Star Trek: The Next Generation: Before Dishonor. The Kalpana Chawla ISU Scholarship fund was founded by alumni of the International Space University (ISU) in 2010 to support Indian student participation in international space education programs. 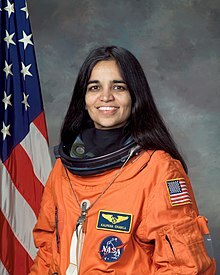 The Kalpana Chawla Memorial Scholarship program was instituted by the Indian Students Association (ISA) at the University of Texas at El Paso (UTEP) in 2005 for meritorious graduate students. The Kalpana Chawla Outstanding Recent Alumni Award at the University of Colorado, given since 1983, was renamed after Chawla. The University of Texas at Arlington, where Chawla obtained a Master of Science degree in aerospace engineering in 1984, opened a dormitory named Kalpana Chawla Hall in 2004. In addition, the university dedicated the Kalpana Chawla Memorial on May 3, 2010, in Nedderman Hall, one of the primary buildings in the College of Engineering. The girls' hostel at Punjab Engineering College is named after Chawla. In addition, an award of INR twenty-five thousand, a medal, and a certificate is instituted for the best student in the Aeronautical Engineering department. The Government of Haryana established the Kalpana Chawla Planetarium in Jyotisar, Kurukshetra. Delhi Technological University named a girls' hostel block after Chawla. A military housing development at Naval Air Station Patuxent River, Maryland, has been named Columbia Colony, and includes a street named Chawla Way. Hostel blocks in Maulana Azad National Institute of Technology, SRM Institute of Science and Technology, Sagar Institute of Research & Technology, VIT University, Samrat Ashok Technological Institute and Pondicherry University have been named after Chawla. Kalpana Chawla Government Medical College (KCGMC) is a Medical College located in Karnal, Haryana, India named after Chawla. Kalpana Chawla Chowk is a name given/dedicated to a crossroad in Borivli, Mumbai in memory of the astronaut. A block is named as Kalpana Chawla Block in her honor in ABES Engineering college Ghaziabad(Uttar Pradesh) India. ↑ 1.0 1.1 1.2 1.3 1.4 1.5 Dismukes, Kim (March 12, 2004). "Kalpana Chawla – STS-107 Crew Memorial". National Aeronautics and Space Administration (NASA). 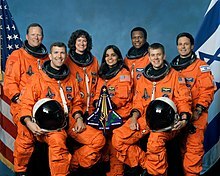 https://spaceflight.nasa.gov/shuttle/archives/sts-107/memorial/chawla.html. ↑ Rizvi, Salim (December 11, 2006). "Indo-US astronaut follows Kalpana's footsteps". BBC News. http://news.bbc.co.uk/2/hi/south_asia/6169111.stm. "Almost four years after the death of the first Indian-American astronaut Kalpana Chawla in the Columbia space shuttle disaster, Nasa has sent another woman of Indian origin into space." ↑ 3.0 3.1 Taylor Redd, Nola (December 19, 2017). "Kalpana Chawla: Biography & Columbia Disaster". https://www.space.com/17056-kalpana-chawla-biography.html. ↑ 4.0 4.1 4.2 4.3 4.4 Basu, Biman (May 2012). Book Review: Biography of Kalpana Chawla. 40-41. http://www.niscair.res.in/jinfo/sr/2012/SR%2049%285%29%20%28Book%20Review%29.pdf। আহৰণ কৰা হৈছে: January 21, 2019. ↑ 5.0 5.1 5.2 5.3 5.4 5.5 5.6 Lyndon, B. (May 2004). "Astronaut Bio: Kalpana Chawla 5/04". Johnson Space Center (NASA). https://www.jsc.nasa.gov/Bios/htmlbios/chawla.html. ↑ 6.0 6.1 Rajghatta, Chidanand (Jul 12, 2004). "NY has Kalpana Chawla Way". The Times of India. http://timesofindia.indiatimes.com/world/NY-has-Kalpana-Chawla-Way/articleshow/775327.cms. ↑ 7.0 7.1 Saxena, Ambuj. "Kalpana Chawla Space Technology Cell | Flickr – Photo Sharing!". Flickr. https://www.flickr.com/photos/ambuj/421069342/. ↑ 8.0 8.1 "IBN News". Ibnlive.in.com. 2010-02-03. http://ibnlive.in.com/news/planetarium-in-kalpana-chawlas-memory/36993-11.html. ↑ 9.0 9.1 9.2 [|Harrison, Jean-Pierre] (English ভাষাত). The Edge of Time: The Authoritative Biography of Kalpana Chawla. Harrison Publishing. ISBN 978-0-9768279-0-0 (Hardcover). http://harrisonpublishing.net/pdf/book/kalpana_book.1.1.pdf. ↑ Salwi, Dilip M (February 20, 2004). "Did you know Kalpana was called Monto?". http://www.rediff.com/news/2004/feb/20spec.htm. ↑ "Tribute to the Crew of Columbia". NASA JPL. http://www.jpl.nasa.gov/releases/2003/columbia-tribute.cfm. ↑ "ISRO METSAT Satellite Series Named After Columbia Astronaut Kalpana Chawla". Spaceref.com. http://www.spaceref.com/news/viewnews.html?id=732. ↑ "Kalpana Chawla Award instituted". The Hindu (Chennai, India). 2004-03-23. http://www.hindu.com/2004/03/23/stories/2004032310280500.htm। আহৰণ কৰা হৈছে: 2007-06-10. ↑ "NASA Names Supercomputer After Columbia Astronaut". About.com. http://space.about.com/cs/nasanews/a/chawlacomputer.htm. ↑ "Space Music – Rock/Pop". HobbySpace. 2005-08-31. http://www.hobbyspace.com/Music/music1.html। আহৰণ কৰা হৈছে: 2010-12-10. ↑ David, Peter; Star Trek: Next Generation: Before Dishonor; Page 24. ↑ Kalpana Chawla International Space University Scholarship Archived March 1, 2011, at the Wayback Machine. ↑ "Kalpana Chawla Memorial Scholarship". UTEP. Archived from the original on October 2, 2011. https://web.archive.org/web/20111002025936/http://academics.utep.edu/Default.aspx?tabid=45209। আহৰণ কৰা হৈছে: 2008-06-10. ↑ "Kalpana Chawla Award". University of Colorado. Archived from the original on March 9, 2012. https://web.archive.org/web/20120309065132/https://www.cualum.org/awards/chawla-award-winners/. ↑ "Kalpana Chawla Hall". University of Texas at Arlington. http://www.uta.edu/housing/housing/residence-halls/kc-hall.php. ↑ "Kalpana Chawla Display Dedicated at Nedderman Hall". The University of Texas at Arlington. http://www.uta.edu/news/releases/2010/05/kalpana-chawla-display.php। আহৰণ কৰা হৈছে: 2013-05-16. ↑ "Punjab Engineering College remembers Kalpana". The Indian Express. Archived from the original on August 27, 2006. https://web.archive.org/web/20060827232518/http://www.expressindia.com/fullstory.php?newsid=18844. ↑ "Space Technology Cell". Kcstc.iitkgp.ernet.in. http://www.kcstc.iitkgp.ernet.in/.